If you are considering buying a barbecue you will have noticed that they burn either solid fuel – charcoal – or gas. So what are the differences and why would you buy one in preference to the other? Charcoal barbecues are cheaper than gas barbecues, for the simple reason that gas valves, taps and pipes cost money. They may also be a bit better for the environment – gas is a fossil fuel which releases greenhouse gases when it burns. Charcoal releases very similar gases when burnt but is not a fossil fuel – charcoal is made by heating wood in a sealed container so it carbonises instead of burning. When wood grows it absorbs greenhouse gases from the atmosphere so the manufacture and use of charcoal simply recycles greenhouse gases. There are two significant disadvantages to charcoal barbecues – the time it takes to get the charcoal burning steadily and the ash that has to be diposed of after the party is over. There are a number of ways to get charcoal burning properly. Most common is to use special lighter fluid or firelighters (the firelighters made for starting coal fires leaves a nasty chemical smell and taste). The charcoal needs to be made into small piles over the firelighters and, after setting fire to the firelighters, left until is is burning well and covered with a layer of grey ash. The coals can then be spread across the barbecue so cooking can begin. This process takes around 20-30 min. A quicker way to get charcoal started is to use a charcoal ‘chimney’. This is a device like a large paint can with no bottom and a wire shelf 1/3 of the way up. The bottom of the ‘chimney’ is stuffed with newspaper, which is set alight, and the top filled with charcoal. There are lots of holes around the bottom, which allow air to enter. Hot air rises, so the flames from the burning paper rapidly heat the charcoal. The processtakesaround 10 min – much faster than using firelighters. 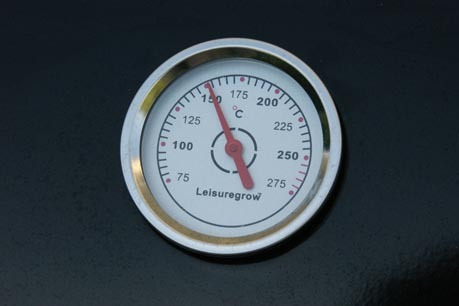 Many gas barbecues have a thermometer set into the lid, giving the cook a better idea of how fast the food is cooking and allowing the barbecue to be used as an oven. Upper-end models also have a glass panel set into the lid, allowing the cook to spot flare-ups when dripping fat catches fire and the food is at risk of burning. Unfortunately the windows are not quite as useful as they appear, as the glass gets covered in a mixture of smoke and cooking fat which can be very difficult to shift. Sometimes the ignition system is operated by the burner knobs and sometimes by a separate ignition button.Some gas barbecue ignition systems require batteries, others are piezo-electric. In the piezo-electric systems there is a piezo-electric crystal which generates a voltage when it is hit. The voltage is used to create a spark, which lights the gas. These system usually have a red ignition button that is quite stiff to operate. The button operates a small spring-loaded hammer which hits the crystal, generating the spark. Gas is very convenient to use. 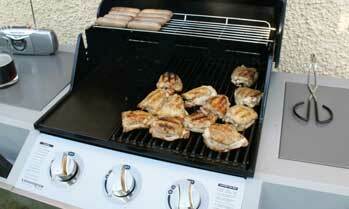 It is controllable and, once set up, a gas barbecue can go from cold to cooking in a few minutes. There is no need for firelighters and no messy ash to deal with. Gas is pretty cheap too – £15 of gas may last you a year or more if you are only a fine-weather barbecuer. On the other hand the bottles are very heavy and most suppliers charge a large deposit (around £30 for a 13kg bottle). FloGas used to supply gas in deposit-free bottles and their website currently says this for most bottles: “No ‘Non returns’ charge applies to this cylinder”. Which might mean they still do! For more information on gas barbecues see Barbecue gas – butane or propane? ← Wolfram Alpha goes live – so what is so special about it?